Below are the results of the 2012 Presidential election, county by county. 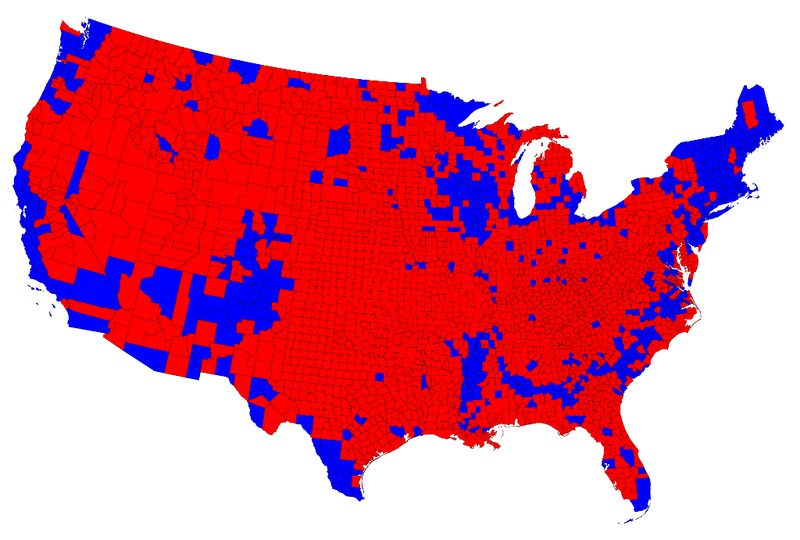 The red counties are Romney’s and the blue counties are Obama’s. If you’re a Republican there is only one problem; the blue counties are the metropolitan areas with the majority of the nation’s population. When it comes to electing Senators and Presidents, population counts. When It comes to electing members of the house of representatives, land area and districts count. During his first term, Barack Obama was largely frustrated by the Republicans, who control the house of representatives. Calls from the liberal media and democratic politicians for “cooperation” and a “Congress that is controlled by adults” are whinnying cries of frustration. The bottom line is that Obama won’t get anything done on taxes, spending, immigration, or gun control without help from Republican house members. I am hoping that we get four more years of gridlock, with the exception of immigration reform. Who says that gridlock is bad? Gridlock is part of the political process. It occurs when agendas are being pushed too far left or too far right. It’s called Democracy, US style. The problem is that Republican house members may not have the will to continue to fight Obama. They are weak-kneed at best. There is nothing wrong with opposing virtually all Obama led initiatives. After all, we are in a full blown political civil war, a fight between European socialism and a free America. If there was ever a time for Republicans to dig in their heels it is now; now and for the next four years. If the Democrats don’t like it, let them go into the “red” counties and win a majority of the voters. They’ll have little luck where people value freedom over equality, hard work over government handouts, and free markets over socialism. How do you come with a topic of interest each week. It is fascinating to read.